TEHRAN/MOSCOW/ANKARA: Iranians already struggling to get by amid spiraling prices fear even more hardship is on the way with the restoration of crippling US sanctions, which Russia and Turkey say are not legitimate. Russian Foreign Minister Sergei Lavrov on Tuesday said Moscow, itself a target of separate US sanctions, expected there would be ways to pursue economic cooperation with Iran despite the reimposition of sanctions on the country’s oil, banking and transport sectors. Turkish President Recep Tayyip Erdogan said the sanctions were aimed at upsetting the global balance and against international law. Tehran said on Tuesday it had so far been able to sell as much oil as it needs despite US pressure, but urged European countries that oppose the sanctions to do more to shield Iran. At a Tehran pharmacy, customers said medicines were already getting further out of reach. Manijeh Khorrami, who had come to buy tablets for his diabetic mother, said the Iranian-made version’s price had tripled since the summer and the foreign version was no longer available. 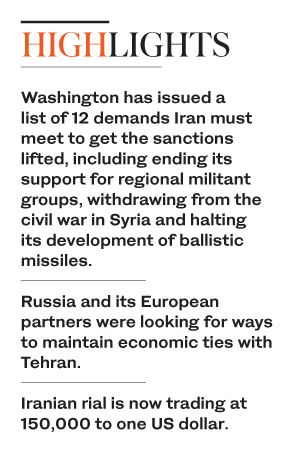 The new sanctions end all economic benefits the US had granted Tehran for its 2015 nuclear deal with world powers, which requires it to curb its uranium enrichment. President Donald Trump withdrew from the accord in May, saying it did not address Iran’s regional military activities and other issues. Iran’s national currency, the rial, has plummeted for months and is now trading at 150,000 to one US dollar, compared to around 40,500 a year ago. The new sanctions will likely undermine the rial even more since they target Iran’s oil industry, a crucial source of hard currency. They also target dozens of Iranian banks, aiming to push the financial sector deeper into isolation. “I don’t know how to explain this to my wife and children,” he said. “A lot of people are not able to buy these things anymore,” said one 22-year-old shopper, Mina Sholeh. In large part, the bet is that Iran’s leadership will be pressured by public outrage. Iran’s economic chaos sparked anti-government protests at the end of last year, which resulted in nearly 5,000 reported arrests and at least 25 people being killed. At the time, the Trump administration cheered the protests. Demonstrations have become sporadic and rare. But bitterness remains among many Iranians who complain about corruption and their government’s costly interventions in Syria and Iraq. “The government is wealthy, it sells oil abroad but it does not care about ordinary people,” said Mohammad Ghasemi, who sells scarves on a street corner.